Several members of the Wyss community played a leading role in the “World Summit on Innovation & Entrepreneurship: The New, Smarter Innovation Economy,” held at the Seaport Hotel in Boston from September 26-28. The summit attracted a diverse group of nearly 600 participants from around the world, whose specialties ranged from smart energy to social media, education, medicine, and more. Geraldine Hamilton led a “Mash-up” event on Friday that featured the Wyss Institute. Headlining participants affiliated with the Wyss included Founding Core Faculty Members Jim Collins, Ph.D., and David Edwards, Ph.D., and Senior Staff Scientist Geraldine Hamilton, Ph.D. Collins delivered a talk entitled “On Reprogramming Life, Reprogramming Economies” in the “Where the Jobs Come From” session on Wednesday and Edwards delivered a special address on “Aspirational Innovation and Design that Matter” on Friday. Hamilton’s participation was multi-tiered. Hamilton participated on a panel on Thursday called “Writing the Future: Trends and Traditions of the Innovation Nation,” delivered a talk about biologically inspired engineering on Friday in the session called “Art of Purpose, Science of Possible: Innovators Altering the World,” and led a “Mash-up” event on Friday featuring the Wyss Institute. 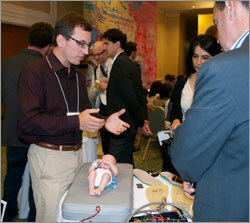 Wyss Institute Staff Engineer Nick Lesniewski-Laas discusses the infant apnea project to summit attendees. 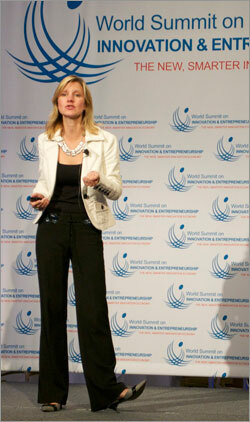 The World Summit on Innovation & Entrepreneurship was launched in 2006 at the United Nations and connects an elected group of the world’s most innovative people to exchange inspiring stories and architect meaningful actions for economic and social innovation. “The Summit sets the scene for some of the world’s eminent dreamers and doers to plot the new frontier of the smarter innovation economy,” according to the summit website.